Perfectly Yourself is for anyone who has ever failed at a diet, survived the collapse of a relationship, or wondered if he or she will ever find a fulfilling career. It's a book for all of us who long to be at peace with who we are, where we are, and what we are doing, not in some distant tomorrow but here and now today. Perfectly simple and sound ideas, thank u Mr. Kelly! This audiobook provides the practical tools necessary to help you regain your fervor and leave your mark on the world - and experience more happiness than you thought possible. Together, we can change the course of history - with humility, generosity, kindness, and joy, one holy moment at a time. Over the past 20 years, Matthew Kelly has seen more of the world than most presidents and more of the Church than most bishops. Now, in this unique and timely book, he proposes that Catholicism is not a lifeless set of rules and regulations, but a way of life designed by God to help each person reach his or her full potential. 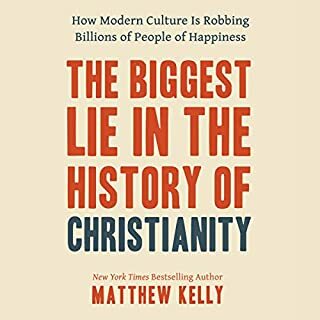 With remarkable insight, Kelly dispels dozens of myths that surround the rejection of Catholicism today and provides a profound and practical vision of what will lead the Catholic Church to thrive again in the future. 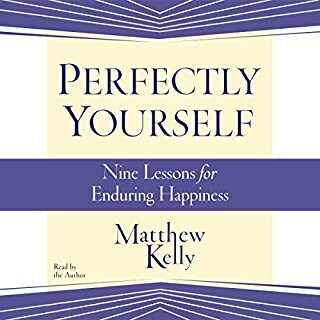 At a time when so many people are spiritually disillusioned and searching for ways to live, love, work, and play that nurture the soul rather than destroy it, Matthew Kelly once again delivers a powerful book that encourages us in our weariness, challenges us in our comfort, and invites us to rediscover the beautiful possibilities God places before us daily. 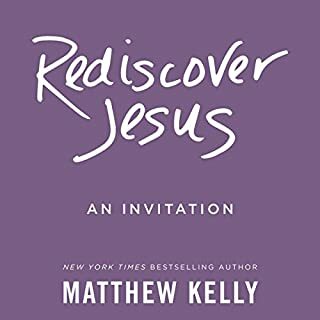 Rediscover Jesus is a profound invitation to seek deeply personal answers to our deeply personal questions. 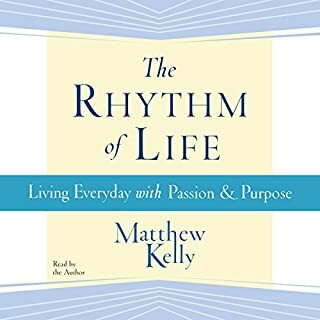 In The Rhythm of Life, Matthew Kelly exposes the lifestyle challenges and problems that face us in this age obsessed with noise, speed, and perpetual activity. Kelly's message rings out with a truth that is challenging and unmistakably attractive. Who you become is infinitely more important than what you do or what you have. Are you ready to meet the best version of yourself? For more than a decade, Matthew Kelly has been traveling the world inspiring people to become the best version of themselves. During this time, he has been amazed at how regularly he is asked: How do I encourage my children to embrace this message? How does your message apply to a family? 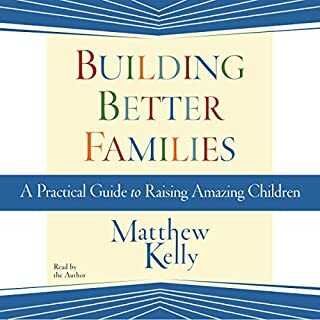 Now, for the first time, Kelly shares with us remarkable insights and sensible everyday strategies for transforming the family into what it should be: a place where each of us can become the best version of ourselves. In The Seven Levels of Intimacy, Matthew Kelly teaches us in practical and unforgettable ways how to know these things about ourselves and how to share ourselves more deeply with the people we love. This book will change the way you approach your relationships forever! One of the major issues in our lives today is work-life balance. Everyone wants it; no one has it. But Matthew Kelly believes that work-life balance was a mistake from the start—because we don’t really want balance; we want satisfaction. Kelly lays out the system he uses with his clients, his team, and himself to find deep, long-term satisfaction both personally and professionally. He introduces us to the three philosophies of our age that are dragging us down. This audiobook contains proven steps and strategies on how to maximize will power and self-discipline. You will learn the true nature of willpower and how it relates to discipline. Once armed with this knowledge, you will be equipped to start ramping up your efforts and make inroads to success in life. You will learn the difference between strategy and planning, which is foundation to achieving long-term goals. Dr. Greg Bottaro explains how mindfulness can help us become aware of the present moment and accept it. Catholic mindfulness is a way to practically trust God more in our lives. Instead of separating faith from day-to-day life, mindfulness helps bridge the gap so we can feel the sense of safety and peace God intends us to have. Following the exercises in this audiobook, you'll discover how mindfulness can help you be more present to everything in your life from a trip to the grocery store or relaxing with friends to listening more attentively to a homily. Now published in over 70 languages, this number one international best seller gently offers answers to life's biggest questions as well as a practical process to help you create prosperity, vitality, happiness and inner peace. This is the incredible story of Julian Mantle, a superstar lawyer whose out-of-balance lifestyle leads him to a near-fatal heart attack in a packed courtroom. His collapse brings on a spiritual crisis, forcing him to seek answers to life's most important questions. The fictional Admiral Janitorial Services has a problem: employees are leaving in droves, and they don't know what to do about it. Interpreting a series of employee surveys, the general manager comes up with a solution that walks the "thin line between genius and madness": hire a "dream manager", part life coach and part financial adviser, to help employees achieve their dreams. Do you have two and a half minutes in your day that you can give to God? This is the beauty of the rosary. You don’t have to pray the rosary all at once and you can pray it anywhere! Do you struggle with praying the rosary: finding time, fighting distractions, worrying about your mind wandering? In Praying the Rosary Like Never Before, Edward Sri offers practical suggestions that come from the rosary’s tradition and, most especially, St. John Paul II. These helpful tips will make the rosary a constant companions through the different seasons, moments, and challenges we all face. Who said praying the Rosary is not scriptural? Only two in 10 Americans under 30 believe attending a church is important or worthwhile. Well over half of young adults raised in the Church have dropped out, with many having a strong anti-Church stance, many even believing the Church does more harm than good. Fr. Josh Johnson was one of these people. In Broken and Blessed, he tackles the harsh realities facing the Church in the 21st century. In Reasons to Believe, Scott Hahn, a convert to Catholicism, explains the "how and why" of the Catholic faith - drawing from Scripture, his own struggles, and those of other converts, as well as from everyday life and even natural science. Hahn shows that reason and revelation, as well as nature and the supernatural, are not opposed to one another; rather, they offer complementary evidence that God exists. He is someone, and He has a personality, a personal style, that is discernable and knowable. How can you believe all this stuff? This is the number one question Catholics get asked - and, sometimes, we ask ourselves. Why We're Catholic assembles the clearest, friendliest, most helpful answers that Trent learned to give to people. Beginning with how we can know reality and ending with our hope of eternal life, it's the perfect way to help skeptics and seekers (or Catholics who want to firm up their faith) understand the evidence that bolsters our belief - and brings us joy. As human beings we are constantly engaging and disengaging in everything we do. We engage and disengage at work, in marriage, as parents, in our quest for health and well-being, in personal finances, environmentally, politically, and, of course, we engage or disengage spiritually. Forgiveness will unleash a power in your life that is underrated and often ignored. It is underrated mainly because it is underused. We fail to capture the power of forgiveness because we are afraid of it, because we have grown comfortable in our familiar wounds, or because we are sinfully stubborn. But the power is there waiting for us. This little book, and the 11 real life stories in it, will help you capture that power. Because everybody needs to forgive somebody. A true story about why we sabotage ourselves, feel overwhelmed, set aside our dreams, and lack the courage to simply be ourselves...and how to start choosing happiness again! Are you happy? It may be the wrong question. Most of us think we are relatively happy, while at the same time knowing that we could be happier - maybe even a lot happier. Ordinary people and the finest philosophers have been exploring the question of happiness for thousands of years, and theories abound. But this is not a book of theory. Resisting Happiness is a deeply personal, disarmingly transparent look at why we sabotage our own happiness and what to do about it. Are you overwhelmed? Do you procrastinate? Do you sometimes feel like you are your own worst enemy? Are you ignoring your dreams? Have you lost the courage to truly be yourself? Do you feel that your life lacks meaning and purpose? Do you find yourself avoiding the real issues in your life and focusing on the superficial? Do you ever wonder what God has to do with any of this? We all experience these feelings and doubts from time to time. But do you know what to do when you experience them? 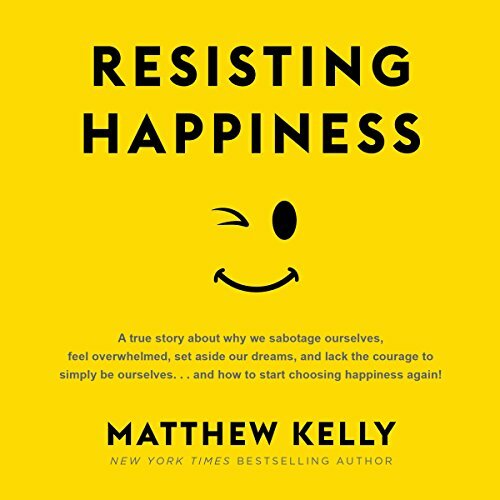 In this fascinating book, Matthew Kelly uses his signature combination of the profound and the practical to help us understand why we feel these things and how to rise above them. Breaking through resistance, Kelly tells us, is essential to becoming the person that God created us to be. What is resistance? It's that sluggish feeling of not wanting to do something that you know is good for you. It's the inclination to do something that you unabashedly know is not good for you. It's the desire and tendency to delay something you should be doing right now. It is resistance that stands between you and happiness. In this audiobook you will learn not only what it is, but how to recognize and conquer it in your own life. Awesome, inspiring, a game changer! 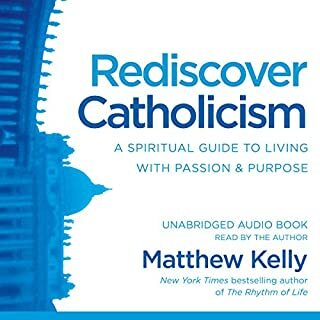 Matthew's philosophy as expressed in this book guides you through the simple steps we all can take to win in life while reconnecting with Catholicism in meaningful and very personal ways. I love that it is read by the author himself. Each point come across exactly as intended. I would recommend this book to anyone, regardless of faith, background and demographic. I wish I had this book 20 yrs ago. This is a hard book to listen to but very important indeed. I found this book very enlightening and insightful, we all have some type or resistance in some form to overcome. I will listen again and work on improving myself as a Christian of God. I would recommend this book to everyone. Not a Catholic at all, but some great wisdom here if you're willing to hear it. thanks Matthew Kelly. This book really does deliver what it promises. But not because I just read it but because it's riding inspired me to make changes in my life. I will recommend this book to anyone at any stage in life. Disappointed. Not what I expected. I believe in God and welcome him into my life. The description of the book did not give any indication that this was the premise of the book. Religion packaged as a panacea. I was really looking forward to this book. It got great reviews and high ratings. I couldn’t finish it. I’m not against religion, by any means, but I felt tricked into a conversion class. I finally turned it off when he mentioned a letter sent to him requesting prayers for someone’s daughter who had been suicidal. She was seeing a therapist now and “doing better” but she had “turned away from God” and “was questioning her sexuality.” So, she was happier and no longer wanted to hurt herself, but the bigger concern is being agnostic and gay? Ok, then. I gave the book 2 stars, because I didn’t finish it and don’t want to be unfair. If you’re religious, maybe it’ll even help you, but I wanted to write this review for those of us who are mature enough to make our own decisions in life without being tricked into some unwanted conversion. And to the author, if you ever see this. I’m happy for you that religion helped you turn your life around. There are plenty of religious people in this world that don’t need to be tricked into reading your book. Try being honest about yourself and your product, and I’m sure you’ll do just find without the false advertising. Last note: that cover photo seems like a real passive aggressive f u to those looking for useful, possibly empirically validated tools for moving past resistance. Be better than that. Within 10 minutes this book became all about God and why you need God in your life. That’s fine for people who are religious, but for people who aren’t, I would have preferred to know this was a religious rather than secular book before I downloaded it. loved everything he said and it motivated me to be better which I have been struggling with. but I wish in the description of the book it mentioned it has a lot about religion because it never mentioned that but had it done that I probably would not have bought it so things happen for a reason. Matthew Kelly thank you. you are inspiring and I am trying to be the best version of myself. This book starts off interesting but as soon as you hit chapter 4 - it starts talking about GOD non stop?! What has God got to do with resisting happiness! The title should mention that this book is about god. This book actually made me resist happiness because it became so depressing in chapter 5! What a shame. The strong Catholic message at first felt jarring as I wasn't expecting it and it reminded me of an extended sermon. Once I settled into it and accepted the message for what it is I found more and more universal truth behind it which I enjoyed and drew many inspiring pieces of wisdom. Loved hearing this read in Matthews own voice as some of the stories were quite personal. He breaks the spiritual life down into simple achievable steps. One of those books where a few key lines land and have the ability to change you if you allow it to.